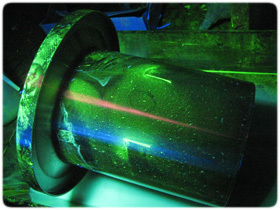 Liquid penetrant testing is a technique, which can be used to detect defects in a wide range of components, provided that the defect breaks the surface of the material. The principle of the technique is that a liquid is drawn by capillary attraction in to the developer, after subsequent development, any surface breaking defects may be rendered visible to the human eye. In order to achieve good defects visibility, the penetrating liquid will either be coloured with a bright and persistent dye or else contains a fluorescent compound. In the former type the dye is generally red and the developed surface can be viewed in natural or artificial light, but in latter case the component must be viewed under ultra-violet light if indication of defects is to be seen.